… Look at the way the “great songwriters” – the musical geniuses of the world write… and then use these principles in your own songwriting process. Through many years of personal research into the creativity process, I discovered that it is possible for absolutely anyone to increase their songwriting power beyond belief by some very specific “creativity boosting” exercises. The unfortunate thing is most musicians, when they sit down to write a song, use their resources in the EXACT OPPOSITE manner in which will get the best results. They use techniques that block most of their creativity, and because of this, never experience the full power of what their mind is capable of creating. What I want to share with you in this article is how you can use a few very important principles which will allow you to write songs well beyondyour current level. And also share some ideas why you many not be getting the results you want at this stage in your songwriting career. Let’s begin with a few reasons why your results may be being limited without you even knowing it. Firstly, one thing that many musicians do chronically that limits their potential, is this: They constantly JUDGE their ideas AS they are creating them. Tell me, have you ever done this? But instead of coming up with ideas, nothing really happens! And then you move onto another thing, but you judge that idea too… “I don’t like that”. Or if you’re trying to write some lyrics, you sit there trying to create “the perfect line”, but because it doesn’t come to you – your page stays blank. If you’ve done any of these things, don’t worry… Most musicians do. So What Should You Do Instead Of This? I’m serious… Don’t keep reading until you have these words on paper in front of you. Ok, here they are… Two of the most important words that artists MUST understand if they are ever to release their full potential. That’s it. Creative momentum. Powerful words. But what do they mean? Well they mean that ideas don’t start flowing if your sitting there trying to CREATE and JUDGE at the same time. Instead, when you create you need to “jump on” any small idea that comes to you. ANY IDEA. Even if it’s a bad one. Then as you follow and experiment with this idea, another will come, in reaction to the first. You follow this new idea, suddenly you notice two more. You pick one and follow it. The momentum builds and builds. Pretty soon you have so many ideas swelling throughout your head, you’ve no trouble playing new music on your instrument. And if you’re writing lyrics, you simply wish your hand could write faster to capture all the ideas. Your unconscious mind (meaning everything that happens inside your head, that you don’t notice) is a powerful, creative resource. Your best ideas are created by your unconscious mind. In fact, everythat’s ever lived created their best ideas with their unconscious minds. But you don’t begin noticing the ideas that stream from your unconscious until you get the momentum going. So what does this mean in terms of writing songs? Well, in a practical sense it means that when you sit down to create, you must do what I mentioned earlier. You must begin playing or writing immediately, and not sit around waiting for an idea to strike. Instead, just play. Create the momentum yourself. Once you get into the “flow” you’ll begin to get in touch with what you’re unconscious is telling you, and the ideas that flow from it. Now, I realize I’ve just given you some pretty big concepts. So it’s completely ok if you don’t understand it all perfectly. Even so, the concepts I’ve just been telling you are absolutely crucial if you want to begin writing songs that surprise even you with their breathtaking quality. If you want to learn more about these ideas and discover exercises and procedures you can use to dig deep into your songwriting potential – and begin writing songs that blow you away… I’ve created a course that goes into these ideas in depth. This course contains the most powerful ideas, concepts, exercises, and techniques that arose in my years of research into creativity, psychology, and human genius. In short, going through this course will completely transform your songwriting abilities, taking you to the next level very quickly. 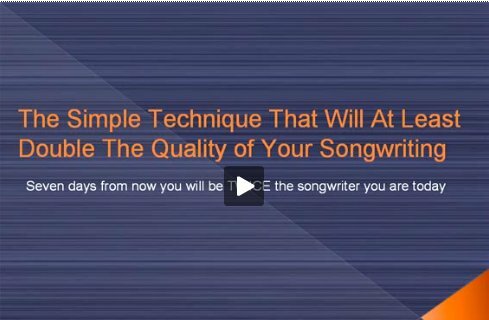 You can use this course to master the art of writing songs by clicking here. And while your on the page you can also check out many stories from other musicians like yourself who have taken the course and had stunning breakthroughs in their ability when writing songs.